May 7, 2014…The International Songwriting Competition (ISC), recognized as the most prestigious and respected international songwriting competition, has today announced its 2013 winners. ISC’s overall Grand Prize is awarded to Japanese trumpeter Shunzo Ohno for his song “Musashi,” entered in the Jazz category. This is the first time in the 13-year history of ISC that the Grand Prize has been awarded to either an artist in the Jazz category or an artist from Japan. Redman, Josh Turner, Keane, Jon Secada, Dido, Garbage, Darryl McDaniels (Run D.M.C. ), James Cotton, Boney James, Jason Isbell, Anoushka Shankar, Monte Lipman (Founder, Chairman, and CEO, Republic Records), Dan McCarroll (President, Warner Bros. Records), Alison Donald (Co-President, Columbia Records UK), and more. 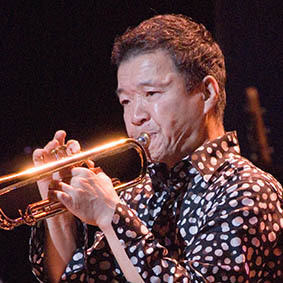 Shunzo Ohno is a virtuosic jazz trumpeter and an accomplished composer and arranger. Ohno has performed with jazz legends Art Blakey & The Messengers, Herbie Hancock, Wayne Shorter, Gil Evans, Larry Coryell, Machito & His Afro-Cuban Orchestra, and many more. With numerous recordings under his own name as a leader, he has also appeared on over 30 more as a sideman and has collaborated on two Grammy winning recordings. would have potentially ended any musician’s career. Surviving both a serious car accident in which his teeth and lips were permanently damaged and a later bout of throat cancer which forced him to relearn his playing, he is a testament to determination and courage, even inspiring a biography and documentary in Japan about his life. ISC awards more than $150,000 in cash and prizes to amateur and professional songwriters around the world. The Grand Prize winner is awarded $25,000 in cash (US) and an additional $35,000 in merchandise and services. Previous ISC winners include Bastille, Passenger, Lindsey Stirling, Gotye, The Band Perry, Kasey Chambers, Gin Wigmore, King Charles, Kimbra, Gregory Porter, Omar Sosa, and many more. For more info, please contact cavery@songwritingcompetition.com. 2013 Sponsors: Presonus, Lowden Guitars, Marshall Amplification, Solid State Logic, Berklee College Of Music, Mrs. Fields Cookies, Airplay Direct, D’Addario, DiscMakers, Thayers, SongU.com, Sonicbids, The Music Business Registry, Indie Venue Bible, Celebrity Access, Tunecore, Independent Mastering, George Stein, Esq., Songtrust, and Taxi.